Update: More hearing details at Climate Science Watch. The minority invited the Discount Viscount, Lord Monckton of Brenchley. What are the observed changes to the climate system? What evidence provides attribution of these changes to human activities? What are the observed and anticipated impacts of climate change in the United States and throughout the world? The highlight of the hearing: Rep. Jay Inslee (D-WA) takes apart the Discount Viscount, beginning at about 1:10:35. Rep. Inslee: And I would note that there's a dispute about whether we actually landed on the moon, and there is a dispute about whether the earth is round, and there is a dispute about gravity in some places. But there's no . . .
Monckton: [Interrupting] Not from me sir. Rep. Inslee: We'll get to you, "Lord" Monckton, shortly. . .
After discussing real science with the actual scientists, Inslee quizzes Monckton on his false representation as a member of the House of Lords and his utter lack of scientific qualifications. April 2010 Temperature Review: Very Warm U.S. The National Climatic Data Center's (NCDC) preliminary analysis of April temperatures, released within the last hour, shows a very warm month across most of the U.S. Record or near-record heat extended from the Northeast through the Mid Atlantic, Ohio Valley, and Great Lakes areas. PM Update: As of 5 pm, the high is 77°, bringing the 7-day average to 74.1°, a full degree above the 1930 record. This value should hold, barring the highly unlikely event of a low below 59° before midnight. 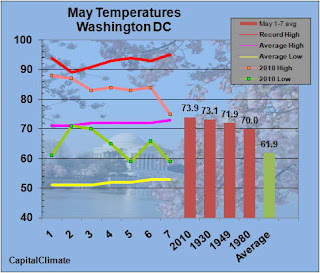 Following the record warmest first week of April, Washington's summer-like first week of May is on the verge of setting another record. 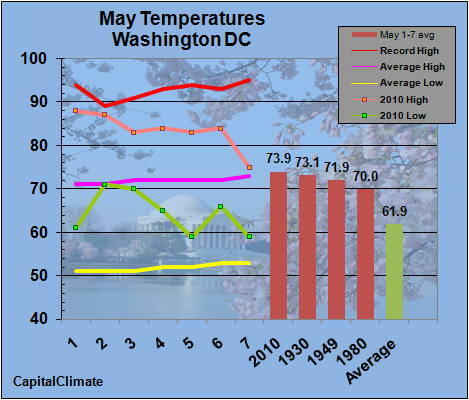 Since records began at or near the current location of Washington National Airport in 1930, there have been only 2 years in which May 1-7 averaged above 70° (1949 and 1930). Following yesterday's midnight low of 66° after a high of 84°, the average through May 6 is 75.1°, well above the 73.1° for the first week of May in 1930. This morning's low of 59° with a forecast high of at least 75° this afternoon yield an expected weekly average of 73.9° or more. Interestingly, there have been no daily high temperature records set or tied during this period. On May 3, however, the record high minimum of 70° blew away the old record of 65° in 1983. The minimum of 71° on May 2 was also a new record. In 1930, record highs were set on both the 2nd and 7th. Dulles Airport, which has less than 50 years of history, did set a record on May 1 with 90° and tied the record of 88° on the 2nd. Dulles also set record high minimums on 3 consecutive days, May 2-4. The 70° low on the 2nd was only 1° below the all-time May high minimum of 71° on the 31st. The rumors regarding a possible move of former WRC (Channel 4) meteorologist Bob Ryan to WJLA (Channel 7) continue. According to a post today at dcrtv.com, Ryan was seen at the Allbritton company Sunday brunch after this weekend's White House Correspondents' annual dinner. Allbritton is the parent of WJLA. For previous history, see earlier Mediarology posts.